Despite previous promises, beleaguered insurance giant American International Group (AIG) has failed to return tens of millions of dollars in bonus payments the firm doled out to executives following the company’s spectacular unraveling and subsequent multibillion government bailout, according to a recent report by the special inspector general for the government’s Troubled Asset Relief Program (TARP). AIG “is a corporation that finds itself in financial distress due to recklessness and greed. Under these circumstances, it’s hard to understand how derivative traders at AIG warranted any bonuses, much less $165 million in extra pay. I mean, how do they justify this outrage to the taxpayers who are keeping the company afloat?” Obama said in mid-March. 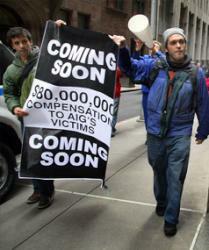 AIG rewarded executives after the government invested $173 billion in taxpayer funds to keep the firm afloat. The company argued that it needed to pay the bonuses so Financial Products employees could unwind its troubled assets. Those are the same employees whose risky bets brought the company to its knees. Intense public outrage over the bonus payments and threats by New York Attorney General Andrew Cuomo to release the names of the individuals who received the compensation, as well as efforts by Congress to impose a hefty tax on the bonuses, led about 18 of AIG Financial Products executives who received more than $100,000 to voluntarily agree to return about $45 million in bonus payments by the end of the year. But thus far, just $19 million has been refunded. The inspector general’s report laid much of the blame over the $165 million in bonuses AIG paid last March on Treasury Secretary Timothy Geithner and the Federal Reserve Bank of New York (FRBNY). “This, coupled with Treasury’s subsequent limited communications with FRBNY with respect to that issue, has meant that Treasury invested $40 billion of taxpayer funds in AIG, designed AIG’s contractual executive compensation restrictions, and helped manage the Government’s majority stake in AIG for several months, all without having any detailed information about the scope of AIG’s very substantial, and very controversial, executive compensation obligations,” the report said. “Treasury’s failure to discover the scope and scale of AIG’s executive compensation obligations, in particular at AIG [Financial Products], potentially resulted in a missed opportunity to avoid the explosively controversial events and created considerable public and Congressional concern over the retention payments. Populist outrage over the bonus issue, however, will likely reach a boiling point again when AIG is expected to distribute another round of retention bonuses in March totaling $198 million, which AIG executives are currently discussing with the Obama administration. “Although a senior AIG official states future awards totaling approximately $198 million are supposed to be paid in March 2010 as part of the contractual [AIG Financial Products] retention agreements, AIG officials indicated that they are working to propose new compensation arrangements to [Financial Products] employees in light of the negative fallout surrounding the March payments,” the inspector general’s report says. But according to unnamed sources quoted by the Washington Post, Feinberg told senior AIG executives he would block the company from making future bonus payments unless bonuses distributed to Financial Products employees last March are refunded first. The inspector general’s report did not that Feinberg “indicated repayment of $45 million in pledged amounts is required by individuals” who made previous agreements to do so. Furthermore, Feinberg “has informed AIG management that the total of $198 million should be reduced,” but he has not said by how much. Some Financial Products employees have indicated they will go to court if need be and fight to keep their six and seven figure bonuses they have already received and the future payments they say the corporation still owes them. The inspector general’s report says AIG “reportedly has already lost many employees” due to tough new compensation regulations implemented last June. In a statement AIG released in October, the company said it fully expects employees at its Financial Products division who received bonuses last March and promised to return the money “will honor their commitments” and have until the end of the year to do so. But with just two days left until 2009 comes to a close, it’s becoming less likely the money will be returned.